The monthly total of earthquakes for December was 397, and included volcanic tremors on 1, 2, and 28 December. In January, seismicity increased to a total of 2,142 events. From the night of 9 January through 11 January, activity peaked with a high of 1,262 events on 10 January, the highest daily number of recorded seismic events since 11 October 1995. The highest plumes reached 600 m in December and 700 m in January. The Global Volcanism Program has no Weekly Reports available for Kujusan. The observation of "smoke" in the Kuju Volcano Group (figure 1) near the Hosho dome (summit elevation 1,762 m, figure 2) at about 1800 on 11 October prompted the local meteorological observatory to issue a volcano alert. Ashfall from the phreatic activity was observed in towns as far as 60 km away, but there was no noticeable seismicity. When observed by the Kyushu Mobile Volcano Observation Team at 1430 on 12 September, steam was rising 400 m from around mid-slope on the dome. At that time there were three vents and fissure vents on the E slope of Hosho in an area ~300 m E-W by 100 m N-S. A photograph published in the Japan Times on 13 October (figure 3) showed steam emissions from numerous points along one ridge of the dome. Figure 1. Map of central and southern Kyushu Island, showing selected cities and historically active volcanoes. Courtesy of Tokiko Tiba. Figure 2. Map of the Kuju Volcano Group (modified from Kuno, 1962). Hosho Dome is near the center of the group. Figure 3. Photograph of steam emissions from the Hosho dome at Kuju. Scanned from a photograph published in the Japan Times, 13 October 1995. Reference. Kuno, H., 1962, Japan, Taiwan, and Marianas: Catalog of active volcanoes of the world, part 11, p. 54-57. Information Contacts: Volcanological Division, Seismological and Volcanological Department, Japan Meteorological Agency (JMA), 1-3-4 Ote-machi, Chiyoda-ku, Tokyo 100 Japan; Tokiko Tiba, Department of Geology, National Science Museum, 3-23-1 Hyakunin-cho, Shinjuku-ku, Tokyo 169, Japan; The Japan Times, Tokyo, Japan. On 11 October, aseismic phreatic eruptions started within the Kuju volcanic group, on Hosho (Hosyo) dome's E side (BGVN 20:09). On 12 October observers found an E-W trending line of vents ~300-m long; also, at that time an ash-bearing plume rose to ~1 km above the crater. The eruption deposited a 100 m2 blanket of fist-sized volcanic clasts; it also emitted mud that flowed down an adjacent valley. After that, the volume and height of the plume gradually decreased until finally ash-bearing eruptions ceased at the month's end. Seismicity stayed low during October. An aseismic phreatic eruption vented from the N flank (not E as previously reported) of Hosho dome on the evening of 11 October (BGVN 20:10). The eruption came from a 400-m-long E-W fissure that includes multiple sub-fissures and craters. The Volcano Research Center (VRC) at the University of Tokyo reported that the estimated volume of tephra from the 11 October eruption was 22,000 m3. Violent steaming from the vents and craters along en-echelon cracks has reportedly continued since then. An image taken by the French SPOT-2 satellite on the morning of 13 October shows an ash plume extending SW.
JMA reported that on 12 and 13 November field observers saw steam vigorously escaping from Vent D. The steam carried volcanic lapilli up to 5 cm in diameter. Another JMA field party witnessed a loud explosion on 13 December, but ejecta were not found. VRC reported that another phreatic eruption on the morning of 18 December produced ~20% of the tephra of the 11 October eruption. Associated tremor, local deflation, and earthquakes were noted. Small ash emissions continued until at least as late as the night of 13 January 1996. In material erupted since 20 December, clear juvenile rhyolite glass shards were recognized in the ash and comprised roughly 1% of its volume. The highest plumes during November and December rose ~300 and 600 m above the vent. On 23 November, earthquakes increased and the daily total was 13; the monthly total was 69. During the most active days in December, the 2nd and 18th, daily totals were 22 and 29, respectively; the total for the month was 134. Further Reference. 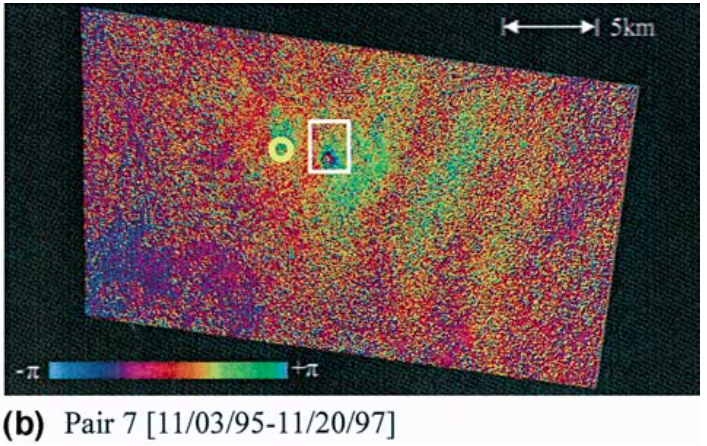 Hiroki, H., and Tatsuro, C., 1995, Eruption of Iozan at Kuju volcano in October 1995: Journal of the Geological Society of Japan, v. 101, no. 12, p. 43-56. Information Contacts: Volcanological Division, Seismological and Volcanological Department, Japan Meteorological Agency (JMA), 1-3-4 Ote-machi, Chiyoda-ku, Tokyo 100 Japan; Volcano Research Center, Earthquake Research Institute, University of Tokyo, Yayoi 1-1-1, Bunkyo-ku, Tokyo 113 Japan (URL: http://www.eri.u-tokyo.ac.jp/VRC/index_E.html); Geological Survey of Japan, 1-1-3 Higashi, Tsukuba, Ibaraki 305 Japan (URL: http://www.aist.go.jp/ GSJ/dEG/sVOLC/kuju_E.html). Frequent earthquakes during the night of 13 January and through the next morning were centered 3-4 km NW of the Hosho dome near Sujiyu spa; eruptions caused minor ashfall around the volcano. Instruments recorded 526 earthquakes during the 13-14 January episode, some of which were felt by local residents. Some earthquakes on 27 January were centered SW of the active dome. Overall, there were 861 earthquakes detected in January, but no tremor. The plume height remained at 100-300 m throughout most of the month. Scientists at the University of Tokyo noted that vesiculated glass was again observed in the 13 January material, and deflation near the crater area was continuing. Information Contacts: Volcanological Division, Seismological and Volcanological Department, Japan Meteorological Agency (JMA), 1-3-4 Ote-machi, Chiyoda-ku, Tokyo 100 Japan; Volcano Research Center, Earthquake Research Institute, University of Tokyo, Yayoi 1-1-1, Bunkyo-ku, Tokyo 113, Japan (URL: http://www.eri.u-tokyo.ac.jp/VRC/index_E.html). High seismicity was recorded throughout February: earthquakes totaled 303. No volcanic tremors were observed. The height of the ash-free plume remained at 100-300 m throughout the month. There was no ashfall. Seismicity increased during 24-27 March, and volcanic tremors were detected late in the month. The total number of earthquakes in March was 507. The height of the ash-free plume remained at 100-300 m for most of the month, with increases to 600 m on 12 and 27 March. High seismicity around Kuju was recorded between 1 and 3 April. The monthly total number of earthquakes was 196. No volcanic tremors were observed. The height of the white ash-free plume remained at 100-300 m throughout the month, but it was ~ 500 m high on 21, 25, and 26 April. The increased seismicity that began in late March and early April (BGVN 21:02 and 21:03) continued during May. The total number of earthquakes in May was 423, of which 283 occurred on the 14th. No volcanic tremor was observed. The plume height remained at 100-400 m for most of the month, but rose to 600 m on 14 May. There were no ashfalls. During June and July, high seismicity around Kuju was recorded. Some of the daily earthquake totals were as follows: 20-30 (18, 26, and 27 June); 39 (3 July); and 31 (15 July). Overall there were 212 events in June and 279 in July. During June and July no ashfall was seen and plume height typically remained lower than 400 m.
High seismicity around Kuju was recorded in August, with a total of 318 events; 72 of them were on 7 August. Plume height remained low for most of August but increased to 700 m on 25 August. No ashfall was observed. The monthly total of earthquakes was 254 for September, 270 for October, and 313 for November. The plume height usually remained at 200-400 m during September, but reached 700 m four times. During October and November the plume height was mostly at 100-300 m, but on 11 and 29 October it reached 600 m, and on 24 November it was 700 m high. On 28, 29, and 30 November, 15 small-amplitude volcanic tremors were observed. Prior to that, tremor was last detected on 29 March 1996. 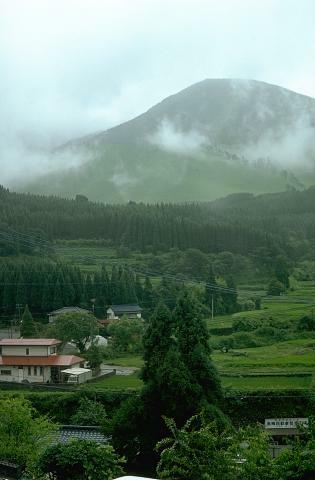 Kujusan is a complex of stratovolcanoes and lava domes lying NE of Aso caldera in north-central Kyushu. The group consists of 16 andesitic lava domes, five andesitic stratovolcanoes, and one basaltic cone. Activity dates back about 150,000 years. Six major andesitic-to-dacitic tephra deposits, many associated with the growth of lava domes, have been recorded during the Holocene. Eruptive activity has migrated systematically eastward during the past 5000 years. The latest magmatic activity occurred about 1600 years ago, when Kurodake lava dome at the E end of the complex was formed. The first reports of historical eruptions were in the 17th and 18th centuries, when phreatic or hydrothermal activity occurred. There are also many hot springs and hydrothermal fields. A fumarole on Hosho lava dome was the site of a sulfur mine for at least 500 years. Two geothermal power plants are in operation at Kuju. Kamata H, Kobayashi T, 1997. The eruptive rate and history of Kuju volcano in Japan during the past 15,000 years. J. Volcanol. Geotherm. Res., 76: 163-171. Ono K, Kubotera A, Ota K, 1981. Aso volcano. In: Kubotera A (ed) Symp Arc Volc Field Excur Guide to Sakurajima, Kirishima and Aso Volcanoes, Part 3, Tokyo: Volc Soc Japan, p 33-52. Sudo Y, Ono H, Hurst A W, Tsutsui T, Mori T, Nakaboh M, Matsumoto Y, Sako M, Yoshikawa S, Tanaka M, Kobayashi Y, Hashimoto T, Hoka T, Yamada T, Masuda H, Kikuchi S, 1998. Seismic activity and ground deformation associated with 1995 phreatic eruption of Kuju volcano, Kyushu, Japan. J. Volcanol. Geotherm. Res., 81: 245-267. Remarks: A small area on the NE side of Mt. Hossho subsided locally following the eruption of Mt. Hossho on 11 October 1995. 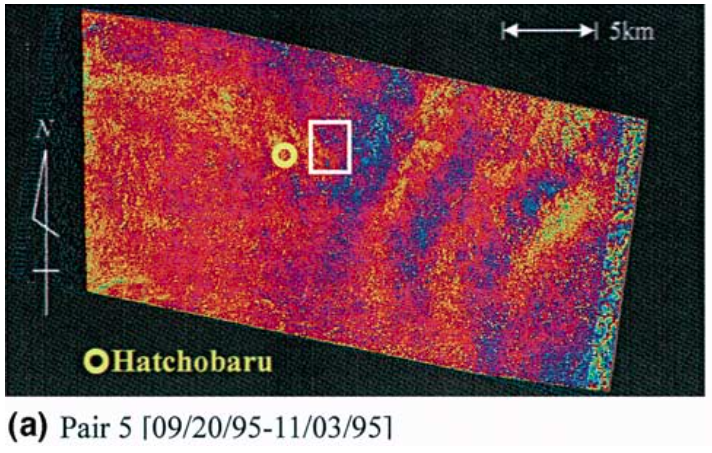 (b) Interferogram in Kuju volcanic region of Pair no. 7 [11/03/95? 11/20/97]. The framed area in both images is the location of Mt. Hossho. This area is same as the area in Fig. 2. The yellow circle shows the location of Hatchobaru area. From: Tomiyama et al. 2004. Reference List: Tomiyama et al. 2004; Sudo et al. 1998. Tomiyama, N., Koike, K., & Omura, M., 2004. Detection of topographic changes associated with volcanic activities of Mt. Hossho using D-InSAR. Advances in Space Research, 33(3), 279-283. Remarks: This deformation event brackets the eruption of Mt. Hossho on 11 October 1995. (a) Interferogram in Kuju volcanic region of Pair no. 5 [09/20/95?11/03/95]. The framed area in both images is the location of Mt. Hossho. This area is same as the area in Fig. 2. The yellow circle shows the location of Hatchobaru area. Reference List: Tomiyama et al. 2004. There is no Emissions History data available for Kujusan. 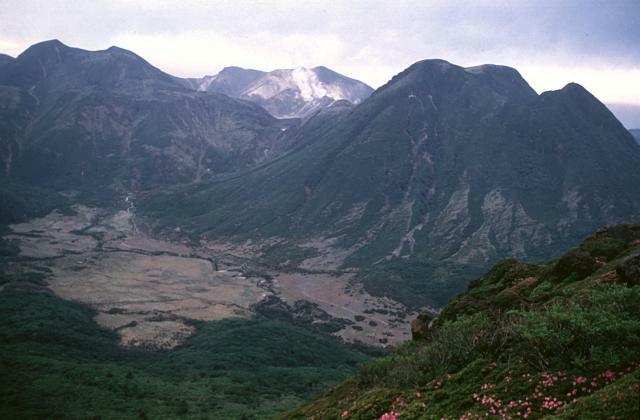 The Kuju Volcano Group consists of more than ten stratovolcanoes and lava domes NE of Aso caldera. Mimata-yama, seen here at the NW side of the complex, is capped by a lava dome. The first reports of historical eruptions were in the 17th and 18th centuries, when phreatic or hydrothermal activity occurred. Many hot springs and hydrothermal fields are located at the Kuju complex. A fumarole on Hosho lava dome was the site of a sulfur mine for at least 500 years. Two geothermal power plants are in operation. The Kuju volcano group in northern Kyushu consists of more than ten andesitic stratovolcanoes and lava domes NE of Aso caldera. This view from the east shows Mimata-yama (right) and Naka-dake (left) lava domes, which formed about 10,000-12,000 years ago. Fumarolic activity is seen here in 1994 on the flank of Hossho-zan (center), the site of small phreatic explosions in November 1995. Many hot springs and hydrothermal fields are located at the Kuju complex. Photo by Yasuo Miyabuchi, 1994 (Forestry and Forest Products Research Institute, Kyushu). There are no samples for Kujusan in the Smithsonian's NMNH Department of Mineral Sciences Rock and Ore collection. Large Eruptions of Kujusan Information about large Quaternary eruptions (VEI >= 4) is cataloged in the Large Magnitude Explosive Volcanic Eruptions (LaMEVE) database of the Volcano Global Risk Identification and Analysis Project (VOGRIPA).